So nice to see someone that looks the same size as me, everyone says i look to little to be having twins. This is my 3rd pregnancy as well, have two girls 5 and 3. You're smaller than others for 16 weeks. :) My 10 wk u/s showed only one baby, but I keep having a feeling that there is actually two. With my first two pregnancies, I wore my regular jeans until 25-30 weeks, and with this one, I was uncomfortable by 10 weeks. 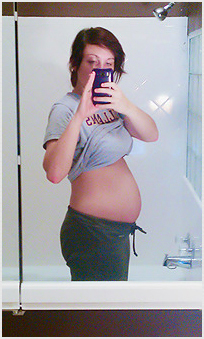 My belly is much much bigger, for only 13 weeks. I came on here to look at pics, and until I saw your's, I figured I must be wrong since others are bigger than me. But I love the bump, and I would love to actually have twins as well!